If you break a tooth, it can be extremely painful. Broken tooth pain may mean the sensitive nerve of the tooth is exposed to the elements, making it difficult or impossible to eat. Whenever this happens, you need to find a Yonkers dentist as soon as possible. Fortunately, Yonkers Dental Spa is a dentist open on Saturday and Sunday — dentists to provide broken tooth repair to ease your pain. Tooth enamel is the hardest, most mineralized tissue in your body. But it has its limitations. A broken tooth can occur from falls, blows to the face or biting on something hard — such as ice, nuts or fingernails. Sometimes, a large dental filling can break the tooth enamel, or decay can compromise a tooth to the point that it breaks. Small chip repair. This broken tooth repair uses a filling or dental bonding. Back teeth often benefit from a filling. Bonding uses tooth-colored resin if the break is visible. Bonding doesn’t usually require anesthesia. Your dentist etches the tooth, applies the adhesive, and molds the resin in layers, using an ultraviolet light to harden the material. Large chip repair. A larger break requires more extensive repair. Your dentist may grind off part of the remaining tooth and cover it with a crown. The crown protects the tooth and restores your appearance. Dentists make crowns from metal, porcelain fused with metal, resin or ceramic. Repair of a break that exposes the pulp. The center of your tooth holds the pulp, which includes the nerves and blood vessels. The pulp can become infected. Pain, discoloration of the tooth or extreme sensitivity may indicate damaged or diseased pulp. Broken tooth repair for these breaks may require a root canal if your pulp is damaged. Broken tooth repair for a split tooth. When your tooth has split vertically into two separate pieces, it may need to be removed, depending on its location in your mouth. Front teeth can be removed and replaced with an implant. Your dentist may be able to save a molar by performing a root canal, topped with a crown. The entire top has broken off, but the root’s intact. These injuries usually involve noticeable broken tooth pain. Your dentist may need to perform a root canal and place a post for a later implant. Implants and crowns require two office appointments: the first for preparing the tooth for the crown by grinding down or building up the remaining tooth material, and the second for permanently cementing the custom-made crown in place. A broken tooth repair for a front tooth. Your front teeth are thinner and can’t support a crown. 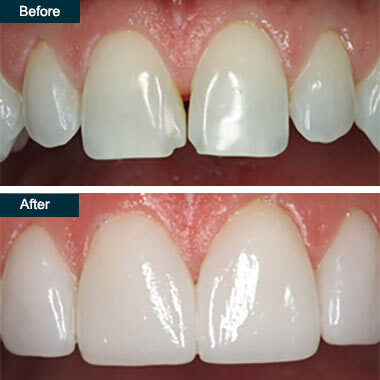 If the break is large enough, you may get a dental veneer. A veneer is a thin shell that covers the front part of the tooth. Your Yonkers dentist removes 0.3–1.2 millimeters of enamel from the surface of your front tooth and makes impressions that are sent to the lab for custom design. You have to return later to allow your dentist to cement the veneer in place. No matter the reason or method, a dentist open on Saturday is committed to relieving your pain and providing custom broken tooth repair. Accidents are part of everyday life, but your dentist helps reduce the severity by providing quick, accurate diagnosis and treatment. Do you have any questions about the broken tooth repair in Yonkers? For more information or to schedule an appointment with the best dentist in Yonkers of Park Avenue Smiles of Yonkers, Westchester County? Please contact our dental clinic for consultation with the dental specialist Farzin Farokhzadeh, DDS.